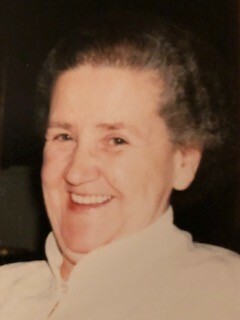 SOUTH HADLEY – Jeannette (Fradette) Depelteau, 93, passed away peacefully on March 22, 2019 at Willimansett West Nursing Center. Jeannette was born on June 8, 1925 a daughter of the late Leon and Adrienne (Lemere) Fradette. She was educated in Bristol, CT schools and was predeceased by her husband Maurice Alfred Depelteau in 1981, her son Armand, sisters Lucille Gagne and Georgette Nault, and her brother Wilfred “Bidou” Fradette, all from CT. Jeannette worked as a cashier for Pat’s Supermarket and Shop Rite for many years and loved talking with her customers. She refereed basketball in her youth and enjoyed WII Bowling, Bingo, and singing with her family. She is survived by her sons Roland (Indian Harbour Beach, FL), Raymond (Venice, FL), Thomas (Knightsdale, NC), Michael (Derry, NH), and Daniel (South Hadley, MA); and their wives Christina, Ellen, Eileen, KJ, and Charlise. Jeannette is survived by her brother Armand Fredette and his wife Bertha of Fairfield, CT; and grandsons Christopher, Jonathan, Jeff, Thomas, Samuel; and granddaughters Aimee, Anna, and Andrea. Jeannette has several great grandchildren, nieces, and nephews. A Catholic Mass will be held at St. Patrick’s Church, 30 Main St., South Hadley on Friday, June 7, 2019 at 11am, followed by burial at Precious Blood Cemetery. Please visit www.messierfuneralhome.com for more details.